LONDON, Feb, 21 2019 - (ACN Newswire) - New forecasts based on data from 96 countries by WARC, the international marketing intelligence service, predict a 4.3% rise in global advertising spend this year, pushing total investment to over US$616bn. This follows on from a 5.4% rise in 2018 - the strongest growth since 2011 - according to WARC's latest Global Ad Trends report, published today. 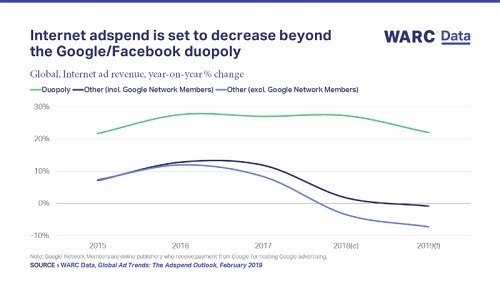 Despite healthy top line growth, the research suggests that total internet adspend - inclusive of desktop, mobile and tablet - will decline by 7.2% this year beyond the Google and Facebook 'duopoly'. Conversely, ad income for the two online giants is expected to rise 22.0% to US$176.4bn, equating to a combined share of 61.4% of the online ad market (up from 56.4% in 2018). James McDonald, Data Editor, WARC, and author of the research, comments: "While advertising investment is stable at the top line level - maintaining a 0.7% share of global GDP since 2011 - the market's undercurrents have changed dramatically in recent years. "The amount of ad money available to online publishers beyond Google and Facebook is now in decline, and the repercussions are potentially far-reaching, with several high-profile announcements of job cuts seen among online publishers already this year. "Print publishers have already been severely hit by the migration of ad dollars online, and while traditional media excluding print have fared admirably to date, their collective take of ad investment is also trending downwards." Internet is the driving force in global advertising growth, with spend expected to rise 12.1% to US$287.4bn worldwide this year. This would give internet a 46.7% share of media spend globally, but in the US - the world's largest ad market - internet is expected to account for over half (54.0%) of all media spend for the first time this year. 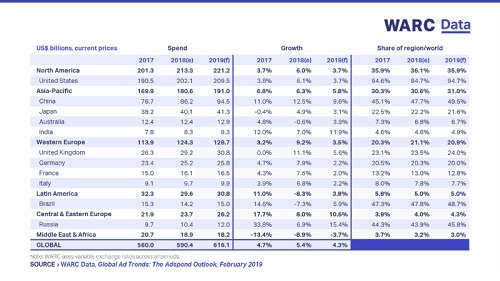 Within internet, mobile adspend is expected to rise 21.9% to reach US$165.7bn in 2019, placing it as the second-largest ad channel worldwide across 96 markets; however, across WARC's 12 key markets - Australia, Brazil, Canada, China, France, Germany, India, Italy, Japan, Russia, UK, US - mobile is predicted to overtake TV to become the largest ad channel this year. Globally, TV will remain the largest single advertising medium in 2019, attracting US$195.5bn, though this represents a 1.3% dip from 2018. Despite this, TV spend will have grown 0.4% each year on average since 2011. Print continues to lose share, with a further dip of 9.5% predicted in 2019. Legacy news publishers in particular are feeling the impact, with many looking to diversify their businesses to make up for lost ad revenue. Out of home (OOH) is benefitting from the increasing penetration of digital sites in advanced markets, with digital out of home (DOOH) expected to account for all of the 2.3% growth in OOH this year (as it already does in the UK). Elsewhere, radio adspend is forecast to grow 1.0% to US$32.5bn this year, following on from a 1.2% rise in 2018. Cinema is expected to be the only ad channel other than mobile not to lose share of global advertising spend this year; cinema spend is expected to rise 7.7% to US$4.7bn. ● North America: Total market growth forecast at 3.7% this year, following an estimated 6.0% rise in 2018 (buoyed by the US midterms and brand spend during the Winter Olympics). ● Asia-Pacific: Growth has been relatively strong since 2011, with an increasingly digital China accounting for near half of all adspend. A 5.8% rise predicted for the region this year. ● Western Europe: The region recorded the strongest growth in 2018, at 9.2%, though this is expected to ease to 3.5% in 2019. ● Central & Eastern Europe: The region is expected to record the strongest growth this year, at 10.6%, driven by a strengthening Russian market. ● Latin America: The region is heavily susceptible to the strength of the US dollar, which resulted in an 8.3% decline in adspend last year. A rise of 3.8% is forecast for 2019. ● Middle East: Markets in the region have been severely hit by the sharp falls in the price of oil, particularly in Saudi Arabia and the UAE. As such, the region has been in decline since 2015 and this trend will continue in 2019. ● Africa: Regional growth is largely dependent on South Africa (44.2% of the total), which entered a technical recession in 2018. A rise of 4.3% is forecast for Africa in 2019. ● 4.3% growth forecast for global adspend in 2019, pushing the total to US$616bn. ● 5.4% estimated rise in global adpsend in 2018 - to US$590bn - the best performance since 2011. ● 7.2% forecast decline in internet adspend excluding Google and Facebook this year. ● 53.3% global ad dollars to be invested in traditional media this year. ● 61.4% Google and Facebook's combined share of internet adspend this year. ● 65.3% share of online display adspend traded programmatically this year. Global Ad Trends is part of WARC Data, a dedicated online service featuring current advertising benchmarks, data points and trends in media investment and usage.